A 26-year-old male presented with complaints of acute onset right iliac fossa pain associated with nausea and vomiting for 4 days. On clinical examination, right iliac fossa tenderness was present. Blood investigations were within normal limits. Ultrasonography revealed presence of mild free fluid in the right iliac fossa. Appendix could not be visualized. On contrast enhanced computed tomography (CECT) abdomen and pelvis, there was presence of free fluid in the right iliac fossa with thickening of the right conal fascia and omental fat stranding. The lumen of the appendix was patent and the tip of the appendix appeared to be thickened. Based on these findings, clinical diagnosis of acute appendicitis was made and patient was planned for laparoscopic appendectomy. On laparoscopy, about 200 ml of hemorrhagic fluid was present in the right iliac fossa and pelvis. A segment of the omentum adjoining the cecum appeared dusky, congested and partially infarcted while the rest of the omentum was normal in appearance. Grossly, appendix, cecum and terminal ileum appeared normal. 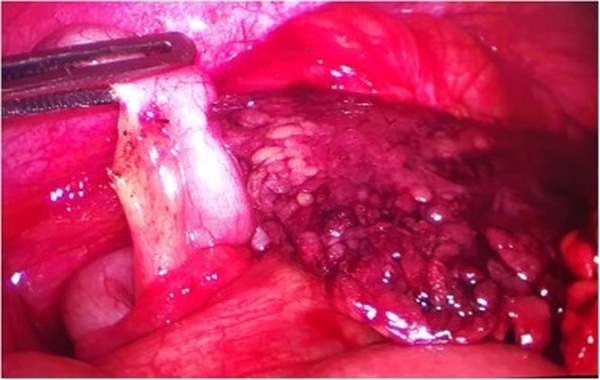 Laparoscopic appendectomy with excision of the diseased part of the omentum was performed. Postoperative recovery was uneventful with two days of hospital stay. On histopathology, appendix was normal with lymphoid hyperplasia while omental specimen showed areas of congestion, hemorrhage and inflammation.